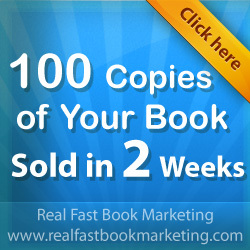 Thank you for becoming an affiliate of the Real Fast Book Marketing training program. The program is sold through ClickBank which is the worlds most respected marketplace of digital products. In order to sell the Real Fast Book Marketing program you must sign up for a FREE Clickbank account and get a Clickbank “Nickname”. If you don’t have a Clickbank nickname you can sign up to get one free (it takes about 3 minutes). You can do that by clicking here. Important! To make YOUR affiliate link you simply replace the xxxx above with your Clickbank nickname. See? Its easy to make your own affiliate link to this great product. So when you customer clicks on the link and buys YOU GET PAID! So what follows are some tools that really make it easy to earn money with this program. Below are a selection of banners in different sizes. Feel free to use them on your website. Important note: You must remove the first and last quotation marks “” from each of the tags above. Use this solo ad copy for advertising in the ezines above. Or you can use it in your own ezine or emails to your list. Feel free to modify the ad copy ad you see fit. Subject: Sell 200 of Your Books in the Next 2 Weeks! It’s true… it is possible (indeed probable) to sell 100 or even 200 of your books within the next 2 weeks WITHOUT a marketing budget! Of course, you’ve got to know how it’s done. Then you must check out..
Subject: How Many Books U Wanna Sell? Yessir, these book marketing techniques are slick, low-profile and can be accomplished by the brand new author WITHOUT previous marketing experience. Check out this website for PROOF of this system in action. I *guarantee* you will be shocked and amazed at how anyone can sell lots of books real fast. PS: The best part is… Even brand new authors can use these techniques. You owe it to yourself to check it out. Add these email signatures to your outgoing emails. If you are running an email promotion you can add them as a PS section. Of if you make a post in the forums add your signature there as well. Sell 100 or 200 Books In Next 2-Weeks with Little-Known System. Under-the Radar Strategies Even New Inexperienced Authors Can Use To Sell 100 to 200 Books in the Next 2 Weeks! 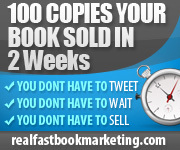 The #1 best kept secret for selling 100 to 200 books within 2 weeks with little or no marketing budget. Use these tools consistently if you want to make good money selling our Real Fast Book Marketing program. We look forward to helping you succeed.